Children and their siblings typically have a range of feelings when it comes to death and dying. Adults can anticipate what feelings children may experience but it is often difficult or even incorrect when we guess their feelings. They may furthermore experience feelings but express them in other ways e.g. sadness may be expressed by acting out. Depending on children’s developmental level, they may also experience a range of feelings in a very short period. These feelings may include short bursts of anxiety, sadness, happiness or other feelings. Children use their bodies and voices in symbolic ways to communicate their experiences. They express themselves through playing, movement and vocally. It therefor makes sense to assess children and therapeutically intervene in these expressive mediums in order to assist them in expressing themselves. 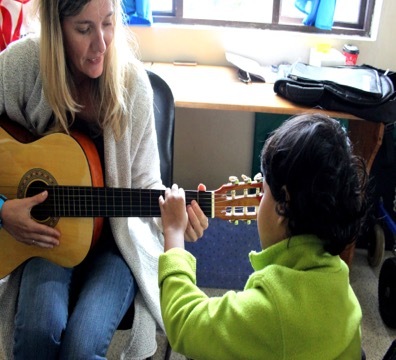 Music therapy is one of the many means that has been successfully used to assist children in expressing themselves. Music therapists can form an integral part of a care team, considering the goals of paediatric palliative care (to provide proactive, comprehensive, and holistic care to infants and children whose disease process is not amenable to cure-oriented interventions” Carter, Feudtner, Rushton & Strong, 2004), and can assist in pain alleviation, emotional and/or spiritual support and bereavement care, but mostly focuses on the emotional care of a child and family members. Children connect and participate in music with ease. This enables music making to be a natural platform for rapport building and emotional expression, whether a child or siblings are expressing sadness, loss, anger or celebrating their childhood and life. The following table demonstrates examples of the various ways in which music can be used during a session, depending on the needs of the child or family members. Self-expression – Exploring life issues (various emotions/thoughts) Song-writing /composing (writing a new song/rap) or meaningful poetry or words that could be used in a song. Experiencing increased joy, control and autonomy and/or decreased pain/anxiety Singing known songs, improvising or drumming or using technology to mix or create music.